tech4coaching | Using technology as a tool to aid your coaching. Using technology as a tool to aid your coaching. Videoing Coaching Sessions with Audio. Sitting in my dim and dusty man cave is a Concept 2 rowing ergometer. The use of a new app and the wireless capabilities of a new rowing computer have got me using this erg on a much more regular basis and even motivated my daughter to do the same. Apps like Runkeeper and Strava give us the ability to monitor exercise using the GPS abilities of the phone but this is the first app that I am aware of that allows accurate monitoring on an exercise machine. Instead of using GPS it integrates directly with the rowing computer on the Concept 2 machine. As a schoolteacher and coach there is always the problem of keeping in touch with members of your teams through the school holidays. These three apps mean that your athletes can train and upload their training sessions to you as a coach or to social media for your whole team to see. The Live Rowing App is available here. The first challenge is the ability to link your phone to the Concept 2 computer – if the computer is a PM5 you will be able to link your phone straightaway as it has wireless capabilities – to upgrade to this monitor use this link. However, a cheaper solution may well be to use the LiveRowing Connect lead, this will ensure that your iPhone can link directly to the performance monitor on the rowing machine and is a little bit more economic than upgrading your performance monitor. The beauty of this solution is that you can use the lead on any Concept 2 allowing you many more opportunities to use the app. Once you have linked your phone to the machine the app will then give you the ability to quick start rowing or to use a featured workout. As such rather than entering complicated rest periods onto the machine yourself you are able to use pre-programmed workouts from the app. These include workouts from Concept 2, CrossTeam Challenge and the British and French rowing federations. Certainly there is a constant motivation for my daughter of competing against my times and a real spur for me to keep ahead of her! You are also able to compete against other users of the app – leading to a worldwide competition – the app even maintains a league table of best performances for you to measure yourself against. Given that my daughter is beginning rowing at her school she has been able to share her results with her coach and continues to improve. For me this app has motivated both of us into regular exercise and has even meant that my rowing machine is not just gathering dust, I really look forward to receiving any feedback from other users throughout NZ and the world- you are welcome to find me in the app as well! As we reach the end of 2016 it is interesting to note where technology for coaching is headed. I am really excited by the potential of the Samsung Galaxy S7 Edge and it may even tempt me from my long term preference for the iPhone. The feature that stands out for me is the waterproofness of this phone. All of a sudden there is potential to use this phone to record Surf Lifesaving, Rowing and Swimming without the nagging worry of dropping your phone in the water. Even the potential to use the phone to video stroke patterns seems to me to be very exciting and I know a real boon for swimming coaches. The iPhone 7 is also billed as a waterproof phone but I would still be inclined to use a case, www.catalystlifestyle.com offers some outstanding cases and a 5M waterproof guarantee. I am really looking forward to seeing some ‘waterproof coaching’ as this new capability is explored. Waterproof coaching can take another step forward with another product by Aquacam – CoachCom. This product is designed to allow the coach to communicate with athletes while they are swimming via an intercom system. Given this device works for 200M the potential spin offs are mind boggling for coaches in terms of being able to have constant easy contact with your athletes. In this video it is being used at the swimming pool – again this is an innovation with so much potential, I really look forward to further exploring this piece of equipment. Another device which has been outstanding for me personally over the year has been yet another phone case. I find the ability to monitor my own stats in real time really motivating both on the rowing machine and on the bike. As well as helping me find my way around a new area it can let me know my current speed and ensure that I am not resting too much. Coupled with using the app Strava these have enabled me to be more motivated personally, unfortunately I am still very much a front row forward on a bike and so not setting any records! Of course the Strava app can also sync with my Rhythm + Heart rate monitor. As you can see below this goes around the arm – thankfully my particular armband is black rather than the yellow shown below. http://www.scosche.com/. Without the inconvenience of a chest strap but still able to use bluetooth to link with fitness watches and other devices, this is a great device to unobtrusively get true heart rate information which can then improve yours and your athletes training. 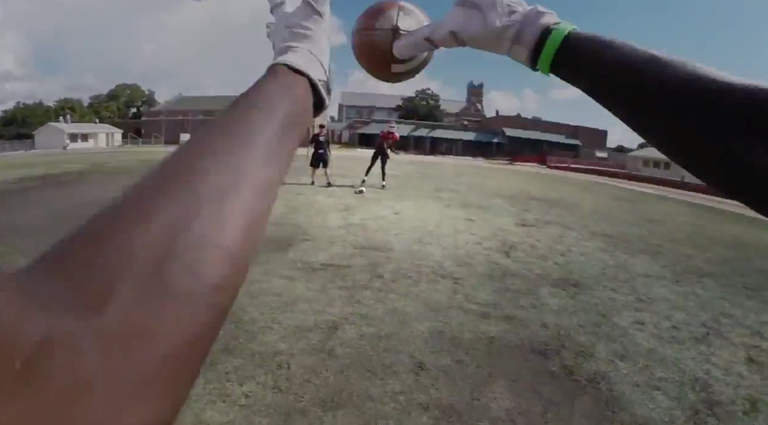 As virtual reality technology becomes closer and closer there are reports from the USA that in the professional teams quarterbacks are now able to review their pass options using VR. Even while injured or fatigued this means a player can review what options he should have taken and hopefully then encourage the correct options to be taken more frequently. While an affordable version of this for the mass market does not seem imminent I am very much looking forward to this becoming available to more and more coaches. In the spirit of looking forward to 2017, I would like to wish everybody a superb break over the next few weeks. For many it is an opportunity to relax, unwind and plan coaching for 2017. I would like to finish with a non-tech accessory for you to enjoy over Christmas: for me this has been the best coaching book I have ever read and certainly one that you should work to get hold of, “Finding the Winning Edge by Bill Walsh”. Link to this article to learn more about the author of this book and his quest for perfection in coaching. Thank you once again for all the support and feedback I have received over the course of this year and I look forward to a successful year coaching with technology in 2017. The advent of Facebook Live has opened up some new exciting possibilities using technology in sports. On its very simplest level people can now broadcast live off their phone or tablets https://www.facebook.com/livemap/# can give you a view into all sorts of events- at the moment it is possible to view Rio 2016 as well as a Rock and Roll competition in Hamilton. On a personal page you can simply tap on update status and then select the Live Video icon. It is very simple at that stage to write a quick description and describe the audience you are aiming for. There are also some top individual athlete and coach pages – with information from their own training sessions and insights into their personalities and the hard work they have to do to get to the top of their sport. Often much of this footage is taken in exactly the way that I have described above the cameras on current phones and tablets easily provide enough quality for this type of broadcast. In terms of value to your club or school there are massive opportunities for linking both with your parents, previous players, old boys and sponsors through using streaming as a tool to engage them in your club. if your event is one in which you can stay close to the action then all you need is your phone in order to record and stream to Facebook Live, with a little creativity this can include interviews with captains, footage from changing rooms and celebrations, even a halt time insight from the coach. However, the quality of this footage is paramount in engaging those who you stream to – it is very difficult to watch some dots in the landscape and actually engage with a sporting event. In order to use and stream from a video camera you need to take the footage from your camera and then into your stream- this ensures top quality footage. I have written a step by step process to achieve this below. I look forward to seeing many video streams from New Zealand and please do not hesitate to get in touch if you would like some help with the process described above. 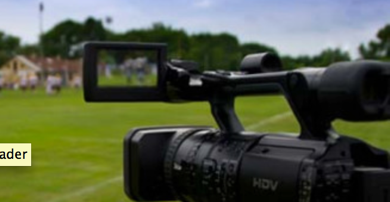 Video is a massively important tool in developing your coaching. Using video with your players can give you the opportunity to break down a technique side by side with your player in front of the screen and talk through aspects of the performance which can be improved. In the same way a coach working alongside a mentor can examine and improve his or her coaching style – even self-critiquing using video often leads to massive coach improvement. One advantage of the new devices we have available is the ease of videoing a coaching session, using a phone or tablet it is very easy to employ an injured player or perhaps a parent to video your session. One issue though is keeping the audio consistent throughout, while being able to see your session is great it is really useful to be able to hear what you are saying too. 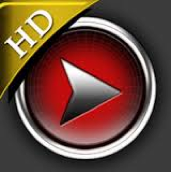 Very simply to add the audio file I use a voice recorder app, on my iPhone this is Voice Memos but each platform has a very similar app and a pair of earphones with a mic function. By using the microphone attached to these earplugs, and a paperclip to keep the mic in place I am able to get an audio recording of my training session. Now I am able to sync these two files using iMovie, you may have noticed that I clapped in the first few seconds of the video, this gives me a perfect sync point to marry the video and audio file. My completed video includes the audio file taken from my phone as well as the video of the session itself, giving me a perfect tool for self review or even more effectively sharing with a coach mentor. This removes the need to purchase expensive microphones but still allows you to take effective video of a training session without the camera being intrusive in the session. Please do not hesitate to get in touch if I can be of any help at all in terms of coaching with technology, my contact details are below. As ever I am very keen to field any questions that you may have about this article or any other aspects of technology in coaching. At the recent Connecting Coaches conference I was asked by a course participant what new technology could be used to help coaching. As ever the answer remains that the most important aspect of all coaching is your relationship with the athlete, a simple phone with a video camera is also a great tool. In my perfect world however, these are some of the new technologies which I think can make a real difference or I find exciting in terms of technology that can be used in coaching. From a coaching point of view this could really lighten your travel bag. The ability to use the iPad pro as a laptop replacement with a keyboard and the apple pencil to input data mean that you do not need to travel with multiple devices. The huge screen will give an opportunity to share video easily with your athletes, while the high quality video camera will mean that you can gain high quality footage to base your coaching on. The large size of the iPad pro makes a mounting system a must, particularly when using the video camera aspect. This iShot G7 tripod mount will enable you as the user to gain good quality footage and be able to display this footage quickly and conveniently by attaching this stand to any existing tripod. An extension of being able to gain good quality footage is also available with the GoPro HERO4, the smallest GoPro camera yet allowing some great footage for coaching as well as the addition of a highlight button to speed up your editing of coaching sessions. This camera will enable you to gain a different viewpoint when coaching, imagine attaching it to an athlete for a training session and then reviewing decisions they have made together while being able to view from his viewpoint at the same time. Drone cameras have introduced a new capability, you can set the camera to follow you while you take part in your activity. While many of these cameras are not fully released as yet they are certainly exciting although still very expensive (around $1500 US), I am afraid I may have to wait until these become a little more realistic in price! There are many different smartwatch and personal fitness tracking type products available now, the Polar M400 combines the ability to measure heart rates with a GPS to measure your training sessions accurately. The watch can also sync wirelessly with the Polar Flow app, which can give you indications about your training intensity and recommendations about the amount of activity you should complete each day. I very much enjoyed presenting at the Sport NZ Connecting Coaches conference and the opportunity to meet many NZ coaches right at the top of their sport. As ever I would welcome contact from anybody who would like to discuss their use of technology in coaching and would like to wish all my readers a Happy Christmas. Since I last wrote an article re apps to use in coaching there have been a number of developments, new apps, new devices and new capabilities. 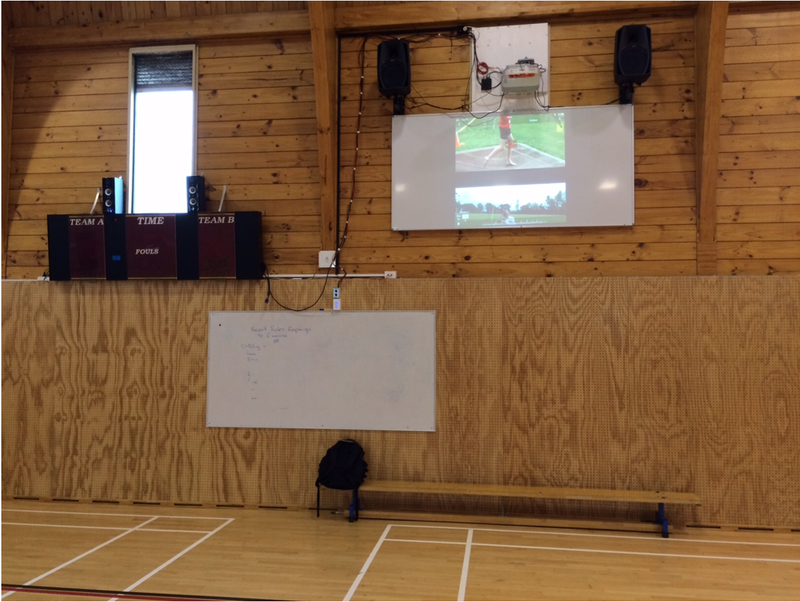 At school we have a great new set up in the gym with an apple tv connected to a projector meaning I can easily and quickly connect my iPad and project my screen into the gym. This gym setup gives great scope for Apps that delay video. I have discussed these before with my favourite being Bust a Move Video Delay, this splits the screen into four with each part of the screen being able to set up with a different time delay. A limitation of Bust a Move is the lack of being able to record the screen. As such while a student/ athlete is able to watch the footage back there is no ability to save that video. ReplayCam will offer the same ability to delay the feed (although only on one screen) but additionally you are able to record the footage. With the new set up in the Gym I have been using this App extensively, recording students gameplay and them viewing the screen to watch their own possessions of the ball. 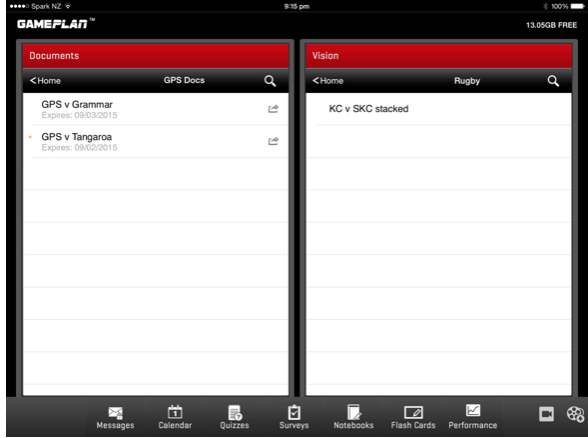 GamePlan is another app that has been extensively used, initially in the USA, but this year has been adopted by many Super Rugby teams. GamePlan gives you the ability to create a bespoke portal for your team. As an administrator you have complete control over what you can share with your players. The app is password protected with the administrator having the ability to control and revoke access should a player lose their iPad. You can share with each of your squad footage from your most recent games as well as schedule details, wellness details and any other documents you choose to share with the team. As well as the ability to share footage you can add video that has been coded and your players have the ability to add their own comments, as such this becomes an interactive vehicle between players and coaches and all delivered straight to their iPads. Coachseek (http://www.coachseek.com) is a really interesting app for computer and iOS devices that organises your coaching business. 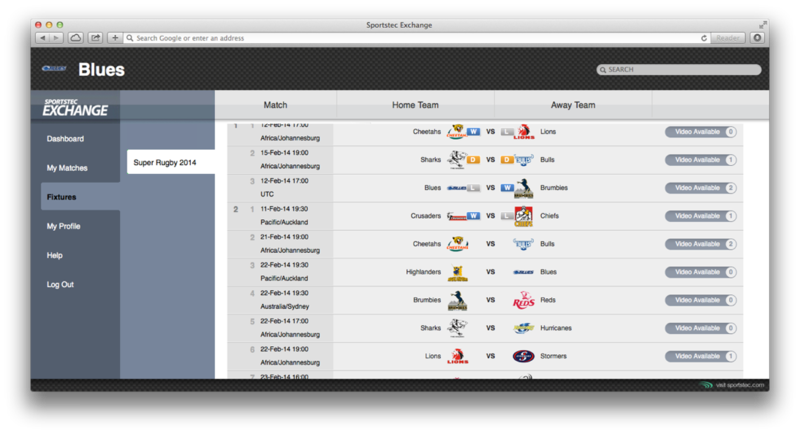 As a coach this gives you the ability to take online bookings and payments. As such your schedule is up to the minute organised and any potential athletes looking for coaching services can instantly see when you are free. The app can take payment from athletes and will also give reminders and take rolls for you. As a New Zealand company they are easily contactable for support and have a lot of success, particularly in monetising coachingbusinesses. For individual coaches who are looking to put their business together I believe this service is well worth a look. Finally I really encourage every coach to have a look at varsaty.com. 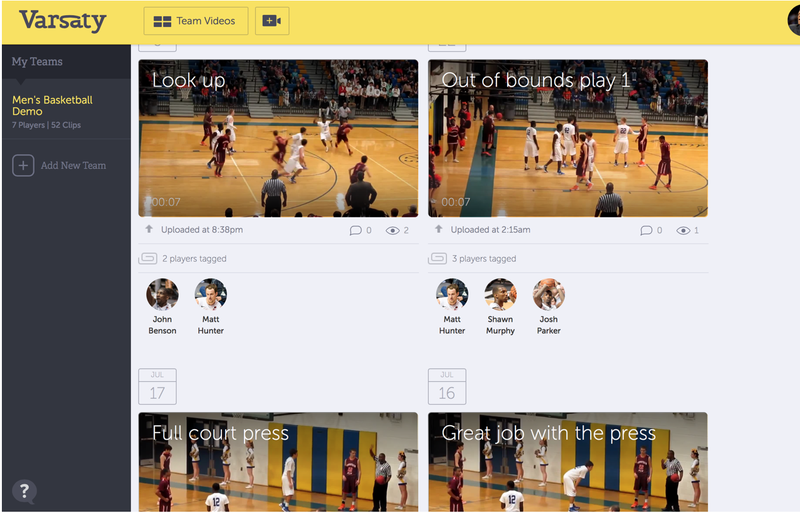 This platform is completely free and gives you the ability to share clips with your players, once you upload a game you can use the online interface to create clips and then to initiate coaching conversations with your players. In the FAQ on the website they guarantee that this site will remain free and I am sure it will be a real asset for coaching and initiating coaching conversations with your players. Check out the screenshot below, the coach has taken clips and then shared it with the players whose icons you can see below each clip – it is well worth having a look. As you can see there have been a number of app developments and as with everything in technology it is a continuously moving feast. On September 9th new iPhones, a new Apple TV and possibly a new iPad were announced, as ever the app developers will then begin work on creating yet more apps! Please do not hesitate to share any more apps that you think I should check out – I can be contacted via the links below. Siliconcoach is a New Zealand example of excellence in technology in sport. 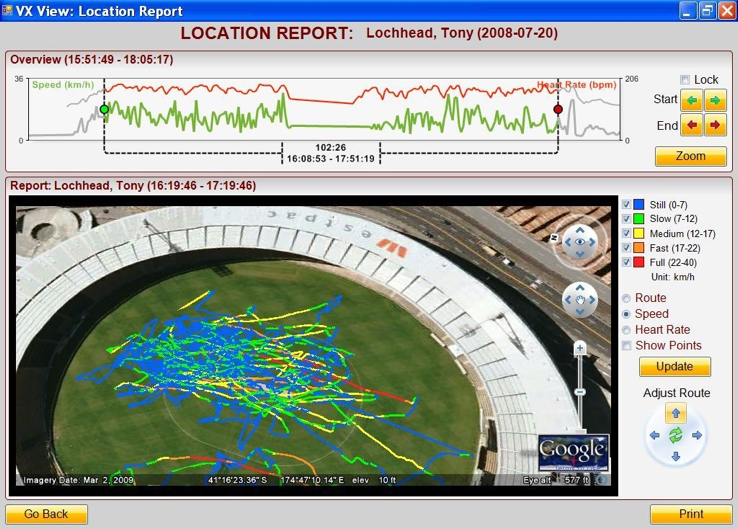 A real forerunner of video analysis the company was founded in 1997, and is still based in NZ. They have a very wide scope for their products including rehabilitation, PE teachers biomechanics analysis, bike fitting and gait analysis as well as traditional video analysis. They have recently announced that Siliconcoach Pro 8 is shortly to be released with some exciting new features. In particular I enjoy the ability of the programme to take video from every source and easily upload it to a central web page for analysis. This addresses one of the key issues that many people have of reliance on a certain platform, with Siliconcoach you are able to use an Android, IOS as well as video cameras, GoPros even a still camera with video capability. This video footage can then be uploaded to a central web page for analysis and easily shared within your ‘zone’. A zone is simply your domain for sharing your analysis video with your team or athletes. As you can see from the diagram you have the ability to open your analysis up to as many or as few of your athletes as you would like. This can be very useful for a team discussion or perhaps one on one feedback with certain athletes. Athletes and Coaches can then contribute to an online discussion around this analysis. This creates a situation in which a video is being used as the basis for discussion and can be massively valuable. It is often easier to illustrate to players your frustration as a coach by this use of video, this will give your athletes a new appreciation of the game. It also fits really well with the NZ coach approach as players can make their own analysis in a process of guided discovery instead of the coach being the all knowing oracle! As well as the online capabilities of Siliconcoach live and the ability to begin an in-depth analysis session via an online forum there is also improved video analysis tools in the Pro 8 version. For clarity these two products are designed to be used side by side, using the pro tools to do some in- depth analysis which can then be viewed when you are physically with your athletes or uploaded into the cloud capabilities of SC Live. Pro8 can capture HD video which means you have top quality video on which to base your analysis. Depending on the hardware capabilities of your computer you will also be able to import dual HD feeds giving you the ability to analyse from different viewpoints. Coupled with some very advanced measurement tools that give you the ability to measure distances and angles on your video and drawing tools to illustrate your analysis to your athletes this creates a very powerful tool indeed. The ability to move the video on Frame by Frame means that it is easy to isolate deviations form the perfect technique, particularly when synched and viewed alongside a perfect model . This ability to compare videos also means that you are able to illustrate to your athletes progressions they have made by using an earlier video with the present day one. This can be a massive motivation for all athletes. 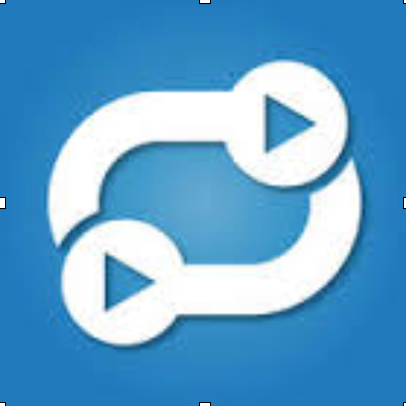 A new feature in Siliconcoach Pro 8 is the incorporation of the Time warp feature into the programme. Previously this was a separate feature but it is now incorporated into the programme. This gives you the ability to delay a video feed for a specified amount of time meaning an athlete can perform a skill and then come and review that skill alongside you. As well as these features you have the security of an active support forum with the ability to make contact to somebody in New Zealand to offer help in ensuring you get the best use of the product. For any further information about Siliconcoach Pro 8 you should contact Graeme Burborough graeme@siliconcoach.com who will be able to discuss your individual needs. This is certainly a product that I use both within my school teaching, it is particularly useful for NCEA Physical Education, and in my coaching. Timewarp was actually the first time in a coaching session that I used the tool of video directly with my athletes, and I still believe this is a massively powerful tool and one that every coach should be comfortable in using. As coaches we spend a lot of time trying to put ourselves into the minds of our athletes and helping them to see the range of possibilities. Even with traditional match day video we can illustrate to them the options that were available and talk to them about the actions they chose but normally not until after the event. 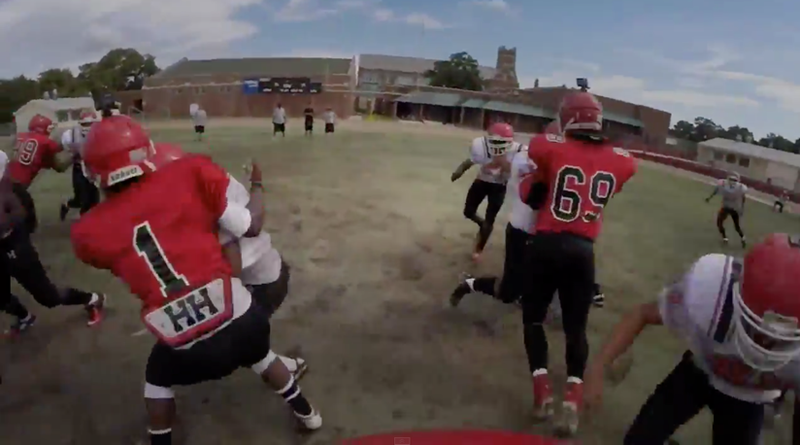 A potential coaching aid is the GoPro cameras and other similar POV cameras. The great thing about the GoPro is the huge range of mounts that enable the camera to be used in almost every conceivable situation. From the end of a surfboard to the handlebars of a bike there are mounts available which mean we as coaches can gain meaningful footage, in US sports a lot of coaches have made use of helmet mounts to gain the athletes point of view. This page gives a range of GoPro accessories- even down to a dog harness! This means that the GoPro can become a useful tool for an athlete and coach, in a range of different sports, particularly those in which it is difficult for the coach to have input during the event. The GoPro can be viewed wirelessly on your tablet or phone so the coach can get a real time view of what the player is seeing. Have a look at this outstanding footage of a downhill mountain bike race. While in the first instance it is great just to be able to view the talent and skill that goes into this sort of activity this would also be a great resource for a skilled coach – did your athlete take the correct line down the course?, where could he gain speed? Should he be approaching jumps faster and more aggressively? The potential value of this footage is reinforced by more GoPro movies from the USA Skiing team. They can be seen on this YouTube clip using footage from chest harness, a follow cam and views from the side. They are reviewing this footage using an iPad which makes the footage even more relevant as it can facilitate a discussion between the coach and the player. There is even a portion of the footage where the coach is giving the skier real time feedback via radio as he reviews the footage wirelessly from her GoPro, from a coaches point of view he is able to have a real time conversation with his athlete, rather than wait until the bottom of the slope. These two examples from Skiing and Mountain Biking are just some of the many different possibilities. The limitation really for every coach is their own imagination and of course the rules of your particular activity. Certainly activities such as rowing and cycling could make great use of real time feedback in this way, imagine as a coach being able to see what your First Five can see or footage from a hockey or football goalmouth. Further innovations using Point of view cameras are the recent ref cam experiments in Rugby, imagine as a coach being able to get this footage in game. An American programme has put together a montage of their You Tube footage for the season, including coaching drills and speeches from their coaches. It is great to be able to see the player’s point of view and spot the coachable moments from their GoPro footage. The shot used at the beginning of this article was of some catching drills , the photo below is a moment in the video where the coach urges the player to “run the alley” . As well as using the Gopro as an all important coaching tool and a really innovative way to link with your athletes I believe that there are potentially real benefits to be taken here for coach education. From asking the American coach in the previous footage why he found it necessary to grab his players facegrill to reviewing your own sessions with your athletes alongside, with a mentor or even exposing yourself to the merciless YouTube comments section if you are especially brave. Even more exciting and from the realms of science fiction is the AirDog https://www.airdog.com. A drone which follows any person wearing a specific wristband from a predetermined height and angle and to which a GoPro can be mounted. Imagine using this to review a coaching session or even the particular work rate of an athlete. I would love to have contact from any coaches who have used the GoPro successfully in their own coaching and welcome any input either via email or twitter on the addresses below. GPS – Big Brother is watching you! We now have technology that allows us to monitor our athletes in every way! Via the use of GPS technology coupled with a heart rate band we can monitor their average speed, maximum speed, distance run, altitude and heart rate. VX Sport is a New Zealand company who produce GPS technology used by many of the major sports teams around the world. This technology is commonplace now for professional sports and contributes hugely to the televisual experience when watching sports. It is now within the reach of coaches and athletes throughout all levels of sport and can make a real positive difference to the information you have on your athletes. More accurate information for the coach should mean that you can design sessions to be specific to your players. The aim of a training session often is to replicate the demands of the game or race that your athlete is engaging in – even in some cases to make training more difficult than that game situation. However, particularly in team sports it is often easier for athletes to coast within sessions and this can go unnoticed by a conditioning coach dealing with a number of athletes. GPS units ensure that the coasting athlete is spotted and can then be provided with accurate data as to what level they are achieving at. The players certainly get the sensation of there being no hiding place, while conditioning coaches are able to scientifically monitor workloads. Have a look at the video below to see how the Hurricanes are using GPS in their training and in their games. In particular they monitor total distance and total distance at speed, players are even running extra shuttles to get their weekly distance up! The two field reports below are taken from two First XV rugby players performing exactly the same session, a half-back and a prop. Heart rate monitors were not added to the athletes for this session. However, we can see the top and average speeds of each player and also tackle the prop as to why he only managed 4195 metres compared to the other player! As the season progresses I will be able to compare these training figures with in game stats and adjust the training loads accordingly. 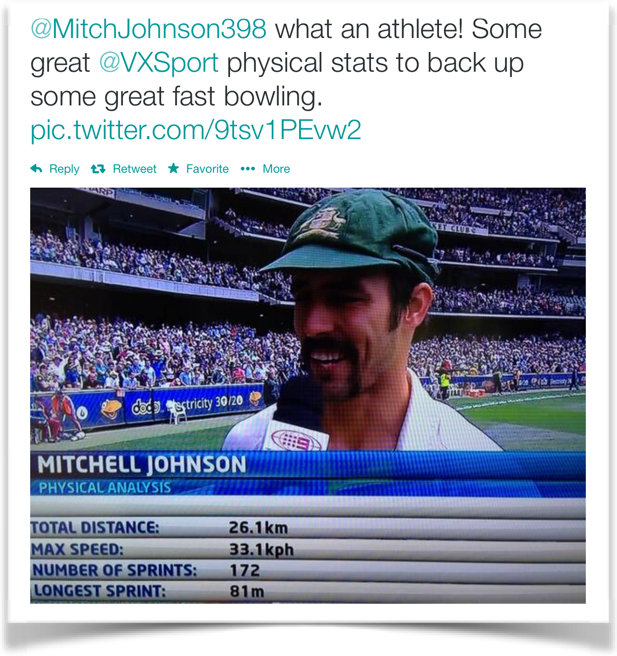 Perhaps a more useful view uses google earth imagery and is excellent to pass to the athlete for a visual representation of the speeds and distance he has achieved – this view relates to Tony Lochhead when he was playing for the Wellington Phoenix. The use of Google Earth means the image is taken from whenever they last took a satellite shot – he wasn’t running around a cricket pitch! The lines on the pitch denote where the player ran during the game and the colour of the line indicates the speed which he ran. By using the zoom buttons located at the top of the screen you can further isolate specific periods within the game for instance in a goal scoring move and investigate solely the speed and location of the athletes movement at that stage of the game. As well as being able to adjust training loads and make training more relevant a vital factor in GPS use is the motivation aspect. There is literally no hiding place and no room for players to coast when they are being monitored by GPS – the results can be shared on a Facebook team page or posted on a noticeboard if appropriate. They can also be used as the foundation for a performance conversation with an athlete, particularly if there is a drop off in match day statistics achieved. They may also be an early warning signal of an injury to an athlete who may not want to share with you that he is injured. When coupled with a heart rate monitor the statistics become even more powerful. In the diagram below you can see the heart rate rise as the athlete’s speed has risen. From a coaches point of view, particularly in some of the endurance sports, this is a very powerful indicator of an athletes fitness and a measurement of the effectiveness of a session. It can also be used as a starter to begin a coaching conversation with athletes able to gain knowledge and physically see the effects that their session has. Gps units have opened up a whole new area of information from a whole range of different sports. 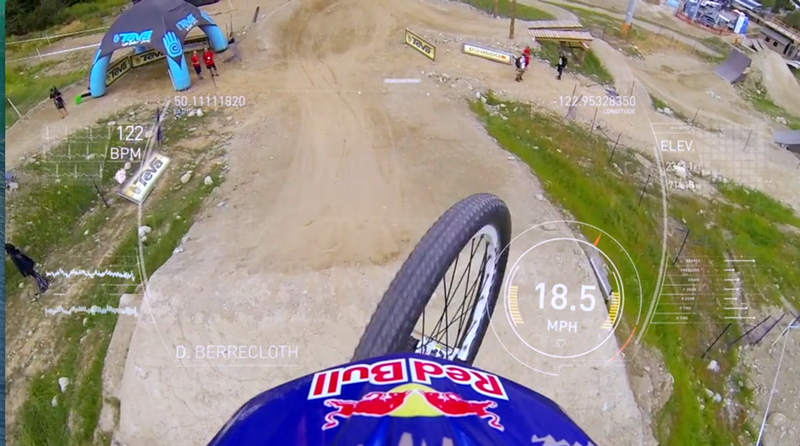 The Go Pro view of this mountain biker includes speed and altitude – information taken from the unit. It gives the viewer a unique perspective and presents the sport at it’s most exciting, it is a superb advert for the sport and would surely attract new participants. GPS units are at a realistic enough price not to be out of reach to amateur clubs and schools in New Zealand, buying a whole set remains the preserve of professional teams but if you are able to get your organisation to make the investment then the dividend will be in more engaged, motivated athletes and coaches with accurate information on which to devise their sessions. As well as these advantages you can also use the unit to review the effectiveness of your own sessions as a coach and reduce the amount of time players may be standing around. In the amateur environment we often have only 3 hours a week training time, how much of that time is spent working meaningfully? Hopefully, with the addition of GPS units to your training sessions you can make a real difference to your players and athletes and be able to judge your own effectiveness, as well as theirs, by critically reviewing the results. 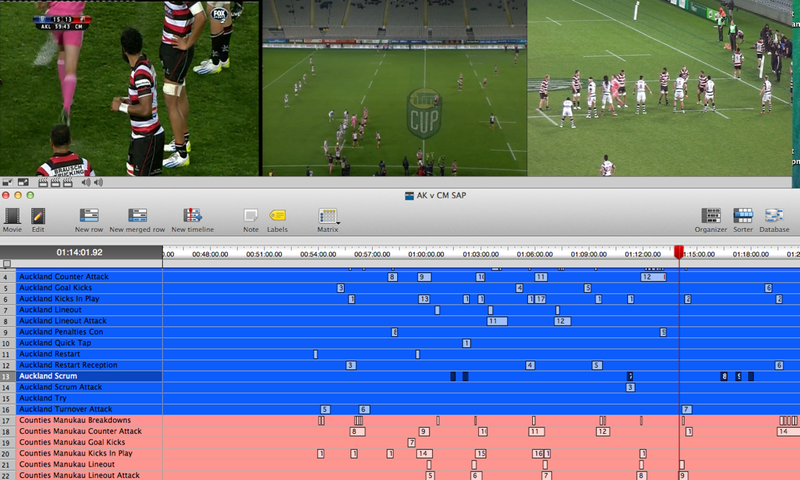 Video Analysis – its all about the questions…. I have used SportsCode products in a range of different applications over the last nine or ten years. Both to assist my teaching of PE and teacher observation in the school environment, and also in coaching at First XV, Premier Club and ITM level with the Steelers. Old coaching biographies that I have read refer to time spent with video, wearing the rewind and fast forward button out to review previous games and preview upcoming opponents. 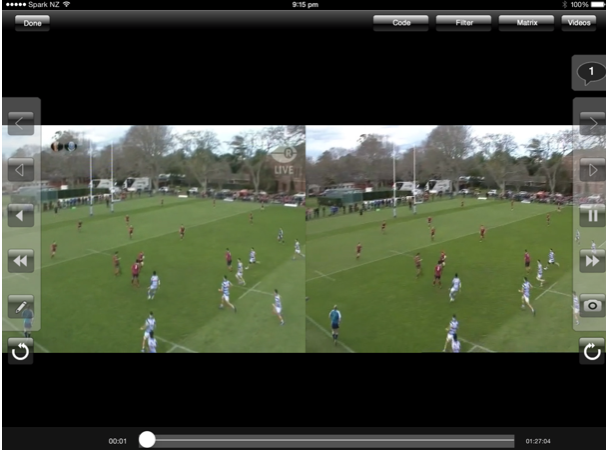 Video analysis programmes give us the ability to do this without the use of video, but instead in a digital format. Instead of being a prized possession, the game tape can now be shared digitally throughout the team and viewed by all. 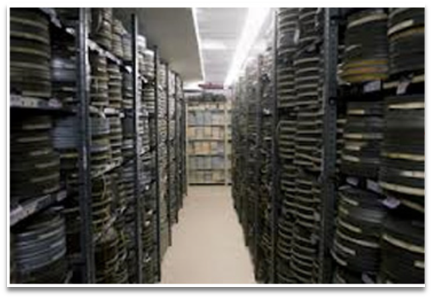 Instead of a dusty room filled with reel after reel of game tape, games are stored digitally and shared via the internet and external hard drives. At the professional level, there are distinct times in the week set aside for players to perform a review of the previous weeks game, and a preview of the upcoming opponents. Typically there are a number of computers available around which players can sit and use the tape to make decisions about trends and opportunities within their game and also spot weaknesses to be exploited in their opponents. As you can see below we have three synched video feeds and are able to isolate all sorts of aspects of play via coding the game i.e. tagging specific moments in the game as scrums, lineouts, lineout attack – post game this allows us to view only those moments rather than the whole 80 minutes. Also within the professional game analysis can be made in game – these you tube clips are examples of the value that can be added by the use of this technology. http://sportstec.com/blog/rugby-union/18669 – The analysts for Gloucester Rugby illustrate their game day – some great use of in-game analysis leading to actual changes here. At the moment in game analysis remains the domain of the professional environment but there are many things as grassroots coaches that we can do. Analysis has become a manageable process for all coaches now without the massive time commitment that used to be inherent when VHS was the only answer. The ability to use a video camera with an SD card has opened up very quick and easy methods of transferring video footage to our computers. iCoda allows a number of spectators/ injured players/team management to contribute to the teams performance with the ability to generate statistics as the game is being played (for feedback at halftime), coding can then be transferred post game to align with the captured video. This allows for analysis to be completed within 15-20 minutes of the game finishing and really allows you to start sharing meaningful clips with your players/athletes. 4. Ensure players view the video and decision makers are able to comment on it before or at the Tuesday session. This allows me to complete the process of video analysis and share it with my players before training starts on Tuesday. The additional time commitment for me is minimal – coding a game takes the same amount of time as it does to watch it. Every coach I am sure would like to watch the game – I merely do so with a laptop and code as I watch. Then the uploads to Dropbox can be done in the background and therefore takes no extra time. Given that Video Analysis has become so prevalent in the professional game, I feel we as coaches should be attempting to prepare our players and develop athletes who think deeply about their part in the game. It is often a great way for players to feel part of the overall strategy and there is nothing more powerful for a coach than when a player initiates a strategy that they think will work having studied the video. As coaches we can develop athletes and create better players by using Video Analysis and involving the athletes in the process. I would like to challenge coaches to challenge their players to become the best they can be and create intelligent athletes through the use of Video Analysis. Please contact me via email jimdickinnz@gmail.com or find me on twitter @tech4coaching.